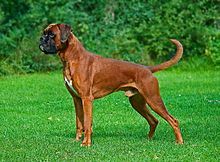 The Boxer is a breed o medium-sized, short-haired dugs developed in Germany. ↑ "Breed Standard". The Kennel Club. Retrieved 9 July 2013. ↑ American Kennel Club. "Breed Standard". ↑ Cassidy, Kelly M. "Breed Longevity Data". Retrieved 25 June 2012. This page wis last eeditit on 12 September 2016, at 21:26.